His Royal Highness Prime Minister Prince Khalifa bin Salman Al-Khalifa hailed the visit of the heads of states and Nobel Peace Prize laureates to the Kingdom of Bahrain. HRH the Premier described the landmark visit as being historic and memorable, bringing together on the land of peace, three heads of states and peace laureates, whose achievements are recognized all over the world. He expressed deepest thanks and appreciation to the heads of states and organisations, recipients of the Nobel Prize, for accepting the invitation to visit the Kingdom of Bahrain, hailing their strenuous efforts to promote and bolster peace all over the world, as well as their statesmanship which contributed to the progress of their states and societies. “This landmark visit will remain engraved in the memory for its high significance and crucial timing”, he said, describing the visit of the Men of Peace as an international recognition of Bahrain’s role in advocating global peace. HRH the Premier delivered the keynote address as he hosted a dinner banquet at the Ritz Carlton in honour of the heads of states and organisations, recipients of the Nobel Peace Prize. The delegation comprised former President of South Africa Frederick William de Klerk, former President of Poland Lech Walesa, former President of East Timor Jose Ramos-Horta and Under-Secretary-General and former Executive Director of the United Nations Human Settlements Programme (UN-HABITAT) Anna Tibajuka, and Nobel Peace Prize Laureate for 2014 Kailash Satyarthi. HRH the Premier said that the current challenges unfolding in many regions necessitate more international concerted action to create the required conditions for peace which will bolster the strenuous efforts exerted by countries and societies to achieve sustainable development and build a more prosperous future. He expressed thanks to the members of the delegation for their press statements in which they hailed Bahrain’s development strides. He reiterated Bahrain’s keenness on pursuing this cooperation for the sake of peace, security and peace in the world, which emanates from its firm belief in noble message of peace, the cornerstone of countries’ security, stability and development. Former Executive Director of the United Nations Human Settlements Programme (UN-HABITAT) Anna Tibajuka addressed the event, congratulating His Majesty King Hamad bin Isa Al-Khalifa, HRH the Premier and His Royal Highness Prince Salman bin Hamad Al Khalifa the Crown Prince, Deputy Supreme Commander and First Deputy Prime Minister on Bahrain’s development strides and success in overcoming all challenges. She paid tribute to HRH the Premier for his dedicated efforts which enabled the Kingdom of Bahrain to make landmark development strides, hailing the Kingdom’s cooperation in various fields, particularly its support to Human Habitat projects. “The Kingdom of Bahrain is at the forefront, searheading future-oriented development projects which changed the Kingdom into a civilized and advanced country”, she said. 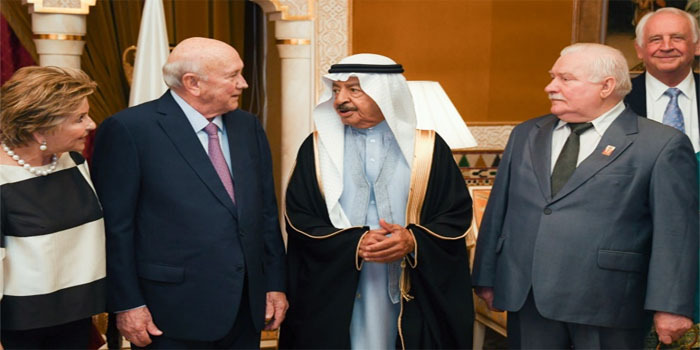 Dave Steward, Chairman of the FW de Klerk Foundation and Planning Committee Chairman at the the World Summit of Nobel Peace Laureates Permanent Secretariat, commended the Kingdom of Bahrain, hailing its progress and development achievements. He reiterated the keenness of the Secretariat on bolstering relations with Bahrain, stressing the possibililty of convening a conference of the World Summit of Nobel Peace Laureates in the Kingdom. He hailed Bahrain’s strenuous efforts to build a more shining future for the coming generations. Global Security Institute President Jonathan Granoff hailed the peaceful coexistence which reigns in Bahrain between all segments of people, describing Bahrain as a model of coexistence and tolerance. He commended HRH the Premier’s stances which, he said, represent as testament to his confidence and wisdeom which contributed to Bahrain’s current landmart development in the sectors of education and health and other fields. The members of the delegation expressed deepest thanks and appreciation to HRH the Premier for the warm welcome, lauding his keen interest in fostering peace, coexistence and building bridges between states and peoples. They lauded the achievements of the Government, in the sectors of education and health, and above all its success in turning Bahrain into an oasis of security and serenity for all religions. The dinner banquet was attended by senior officials and ministers in the Kingdom of Bahrain.